Riproponiamo questa bel quilt che Tiziana ha dedicato al figlio Alessandro. "Bloggers Quilt Festival", edizione autunnale. Clicca qui per vedere tante proposte da quilt bloggers di tutto il mondo. A beautiful butterfly blowing in the wind. I love the pattern and colours you have used. Your photos are wonderful as always!! I love how the colors go together in your quilt! The butterflies add a nice touch to a great quilt design. You do such a nice job photographing your work. 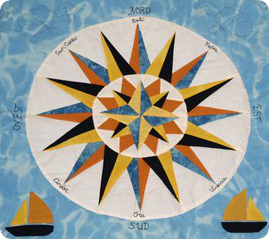 You've chosen such lovely colors to showcase that pretty pattern and the resulting quilt is wonderful! Love the fabrics! I'm sure Alessandro will love it! Your lattice quilt looks great. I really like the way it frames the feature fabric. Love the quilt. Very beautiful. Thanks for stopping by the blog... :) And hello to you from Toronto! Very beautiful work, thank you for sharing. I love your quilt- I have this pattern on my to-do-list as well! Beautiful! I am planning on my making a quilt very similar to yours soon... I am working on cleaning out my stash, so I hope to make mine soon. Beautiful quilt, I like the pattern you used. The butterfly fabric is wonderful too.